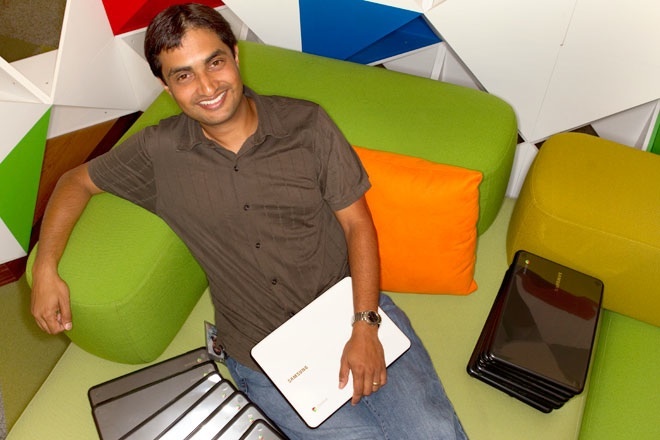 Google's Rajen Sheth and his new baby: the Chromebook. Photo: Jim Merithew/Wired.com. Rajen Sheth was grinning from ear to ear. And he looked barely old enough to shave. But his answer carried some serious weight. “Gmail,” he said. It was 2004, and Sheth was interviewing for a job with Google’s enterprise division. If you could call it that. At the time, the division spanned all of 25 employees and one lonely product: the Google Search Appliance. Google had stuffed its famous search engine into a server for use inside the enterprise, and Sheth was asked the same question every candidate was asked: Is there another Google service we could bring to corporate customers? Google enterprise vet Matt Glotzbach remembers Sheth’s immediate response as a lighthearted moment. “With all due respect,” he says, “Rajen looks like a 15-year-old kid.” But by the end of the interview, Glotzbach was convinced, and six months later, Sheth was pitching his Gmail idea in a meeting with CEO Eric Schmidt and the rest of the Google top brass. Schmidt rejected it, insisting the division should focus on search. But as Sheth left that meeting, the ear-to-ear grin returned, and he vowed to pitch it again. Seven years later, Sheth is widely known as the “father of Google Apps,” the online office apps suite he built around Gmail and grew into a service that 4 million businesses now use in lieu of traditional desktop packages such as Microsoft Office and Lotus Notes. That’s still only a sliver of the overall market, but Sheth’s baby is in many ways a product that defied expectations. And now he’s at it again. Late last year, Sheth left the Apps business to lead a new charge into the enterprise, urging businesses to move away from traditional hard-drive-equipped machines running local applications and embrace a new breed of stripped-down laptop that runs all apps inside a web browser: the Google Chromebook. Running the company’s Chrome OS operating system, the Chromebook is an even more audacious gamble. Unlike Android – Google’s other operating system, which creates a native apps platform for mobile devices and tablets – Chrome OS provides just enough hardware management to run a browser, and nothing more. In other words, the system is a bet that the web is ultimately more powerful than native platforms – and may one day displace them all. For Sheth, Chromebooks are just a natural extension of what he first glimpsed nearly eight years ago. Apps moved traditional office apps into the browser, and Chromebook seeks to move everything into the browser. The model is ideal for the enterprise, Sheth says, because it simplifies what you get from the traditional desktop or laptop. Like an ordinary browser, the lightweight Chrome OS can be readily updated over the wire. Most other software, including data, resides on the web. And each web application is confined to its own “sandbox,” so it doesn’t touch the rest of the system. Like Sergey Brin and Google boss Larry Page, Rajen Sheth studied computer science at Stanford. But then he joined Microsoft. When Stanford gave him a master’s degree in 1999, Microsoft was reshaping Hotmail, the pioneering web-based email service it purchased a year earlier, and Sheth ran the development of Hotmail’s first spam filter. After a year at Microsoft, he moved to a Silicon Valley startup known as Zaplet, where he built what he calls “future email technologies.” But then came the enterprise. In 2003 and 2004, while VMware was still a 300-person company that was just getting into server virtualization, he oversaw the company’s ESX hypervisor, a technology that would eventually reinvent the data center. It was Sheth’s dual background — as much as his Gmail pitch — that won him the job at Google. When he interviewed, Google had only recently hired ex-Apple man David Girouard to run the fledgling division, and Girouard had just brought in Matt Glotzbach as his first product manager. Sheth was his second. The mix was essential to the rise of Google Apps, including the “entrepreneurial” bit. According to Glotzbach, Google Apps was in beta only about a year after Eric Schmidt rejected the idea. And with Sheth leading the way, the Chromebook was transformed into an enterprise product even quicker. According to Sheth, as Google prepped the Cr-48, an early “beta” version of the Chromebook, a lone product manager was tasked with finding a business or an educational institution interested in kicking the tires. In the end, he signed up 55 businesses and two school districts, and when the Cr-48 was unveiled in December at a press event in San Francisco, it was recast as a machine for the enterprise, a system that could drastically reduce the dreaded TCO by moving most software and data onto the web. Google bills the Chromebook as a kind of disposable laptop. If you lose the machine or trade it in for another, (most) all of your applications and data are waiting for you when you boot up a new one. Taking this idea to the extreme, the company is offering subscriptions to the machines, which are manufactured by Acer and Samsung. For $28 per machine per month, you get those continuous software updates, a web-based management console, Google tech support, and yes, hardware replacements. A three-year agreement is required, so you pay about $1,000 per machine over the life of the contract. When the Chromebook was unveiled at the Google’s annual developer conference this past May, Sheth pointed out that according to Gartner, businesses end up spending between $3,300 and $5,800 over the life of a traditional desktop, and he argued that the Chromebook would cut this figure in half. Now, a Google study puts that traditional desktop cost at about $6,225 over a three-year period, with about $585 a year spent on IT software and infrastructure, $3,435 a year on desktop management, and $1,455 a year on “soft” costs (including things like lost productivity due to downtime). So, the pitch is now more than half. Yes, there are ways of mitigating the limitations. Some Chromebooks are available with built-in cellular wireless antennas and two years of free (but limited) data. Google and others now offer web applications that provide at least a modicum of offline tools. And Citrix is now offering a virtual desktop tool that lets the machines run “legacy apps” — i.e. Windows applications – via a server. But ultimately, these laptops constrain what you can do. Even if you can get by with Google Apps and other web-based tools, it can be difficult to move files and other data between the machine and these apps – and from application to application. You may find a web-based image editing tool you like, but shuttling images to and from the tool will try your patience. Sheth acknowledges that this sort of thing can be a problem. But he points out that Google recently added a local file manager to Chrome OS in an effort to ease these frustrations, and he points out that this operating system is constantly evolving, much like today’s web browsers. “The number one thing about Chrome OS is that it doesn’t stand still,” he says. Google products are an eternal work in progress. Famously, Google Apps spent five years in “beta.” Sheth is well aware that today’s Chromebooks aren’t right for everyone, but he believes this will change quicker than you think. That’s another bold statement. But even the critics see Google’s point. Despite his skepticism of the first Chromebooks, Gillet goes on to point out that a new Forrester study indicates that businesses are more open to the platform than he expected. According to the study, 16 percent of businesses said they would consider a machine that only ran web applications, and 47 percent said they consider one if could handle desktop virtualization was an option. Given Sheth’s stance, it’s no surprise that Google is targeting educational institutions as well as businesses. The younger generation grew up in a web-centric world, and Google knows that if it can get them using its disposable laptop now, they’ll use it down the road. The world was skeptical of Google Apps, too – and much of it still is. But according to Google, over 5,000 businesses switch to the online apps suite every day. Though many outfits are reluctant to put their data on someone else’s servers – for religious as well as legal reasons – the paradigm makes a tremendous amount of sense for other reasons. With the Chromebook, Google is extending the paradigm, stretching its faults but also its strengths. On one level, Google’s Chromebook for Business effort looks an awful lot like an afterthought. Like Google Apps and the Google Search Appliance before it, the Chromebook began life as a consumer play, but before the machine even reached the market, Sheth and company tapped it for use in the corporate world. As Forrester’s Gillet points out, if Google had designed the machine from the ground up as a corporate box, it would have been a desktop rather than a laptop. A desktop is far more likely to have an internet connection. As it stands, Google is still working on a desktop version for call centers and developers. But the whole idea of Google’s enterprise division to “consumerize” enterprise IT using Google’s existing creations, and clearly, whether these are afterthoughts or not, Google is intent on diversifying its balance sheet with a slate of business products that don’t rely on ad dollars. Online ads account for over 95 percent of the company’s revenues. Like Google Apps, Sheth says, the Chromebook and its Chrome OS are here to stay. Though many pundits question the machine’s ability to satisfy today’s corporate worker and some voices insist that Chrome OS will soon bow to Android — that there’s no need for two Google operating systems – Sheth is adamant the company is thinking much further down the road. Echoing Google co-founder Sergey Brin, Sheth says that Chrome OS and Android may eventually merge. But he indicates that Android will be the one bowing to Chrome OS, not the other way around. After all, this is Google, where The Official Belief is that everything will eventually move to the web.